DrayTek's new WebSmart Series switches integrate seamlessly with DrayTek routers and access points to ensure plug-and-play deployment and centralized management across your network. The new VigorSwitch 1280 is a 28 Gigabit ethernet port managed WebSmart switch. It comes in two flavors: the G1280 and P1280 which is the POE version. These switches come with an aggresive price point and are yet powerfull and feature rich. VigorSwitch 1280 has adopted a brand-new interface design and support for central management to make configuration and management much easier. The new dashboard shows the status of the system and each of LAN ports at a glance. The modern responsive web design allows Network Administrator to monitor and configure the switch effortlessly via all kinds of devices, however loging to the switch web interface is most of the time not needed as it can be controlled and configured directly from the Router's Web Interface. i.e. Setting VLANs, QoS and other settings can be synced and pushed from the router GUI.Furthermore it can also be managed from Drayte's centralized cloud management application ( ACS ). Most of these switches support the Central Switch Management (CSM) feature set on DrayTek's 2925, 2926, 2952 series routers. With the SWM, network administrators can monitor and manage all their connected DrayTek VigorSwitches from their router's GUI for a seamless network deployment. Administrators can monitor and shutdown each individiual port and set port schedules, configure VLANs and perform maintenance on the switches without leaving the router's GUI. Click here for more information on all the available Central Switch Management features on DrayTek routers. The new VigorSwitch P1280 with 24 PoE+ ports and 4 combo Giga SFP/RJ-45 ports are perfect for a network with wireless access points, IP phones, and IP surveillance cameras. Equipped with port-based and tag-based 802.1Q VLANs as well as the auto Voice VLAN and QoS features which help to improve the VoIP call quality on the network. 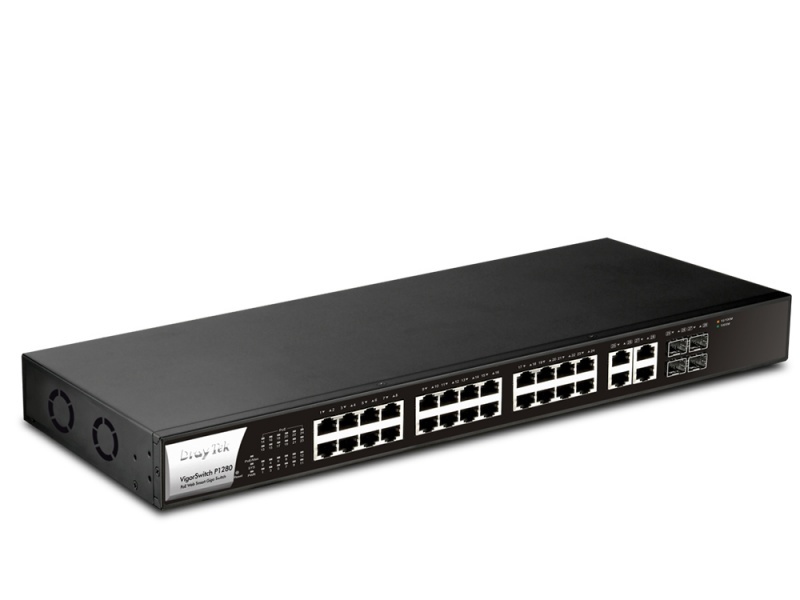 The switch offers a 340 Watt PoE Power Budget with Power Consumption Monitoring and PoE Scheduling. This switch supports the Central Switch Management feature set in DrayTek routers. DrayTek also offers a range of other 8 port and 24 port PoE and non-PoE Gigabit Websmart and fully managed switches to streamline your network deployment. Call us for more information.